Endoscopic sleeve gastroplasty is a safe and feasible treatment for obesity. This study is focused on our technique modification which suggests a different suturing pattern in order to distribute suture tension more evenly. A retrospective study of 148 patients (121 women) who underwent this procedure and were monitored for 12 months was conducted. The average age was 41.53 ± 10 years. The average BMI was 35.11 ± 5.5 kg/m2 with the average initial weight being 98.7 ± 17 kg. A subgroup of the first 72 patients (60 women) were monitored for 18 months. A new running “Z” stitch pattern was used to provide gastric cavity reduction by means of 4 parallel suture rows. The stitch pattern was intended to provide a homogenous distribution of the disruptive force on the suture among all stitch points. %TWL was 17.53 ± 7.57 in 12 months and 18.5 ± 9% in 18 months indicating durability of the procedure. 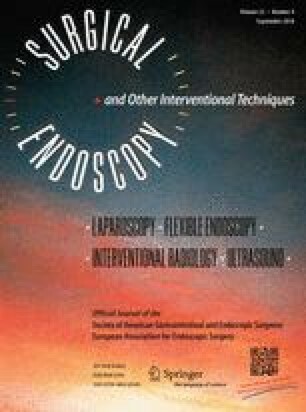 Patients with a BMI < 35 benefited most from an endoscopic gastroplasty. Leptin did not predict a response to endoscopic gastroplasty and decreased in all patients. In just one case there was a mild bleeding (0.67%) at the insertion point of the helix, which was resolved by sclerotherapy. Endoscopic gastroplasty offers a real choice for obese patients. This single-center experience with a modified suturing pattern provides a successful technique for weight loss. Dr. Javier Graus has an equity interest as consultant of Apollo Endosurgery, Inc. Dr. Jacques Himpens has an equity interest as consultant of Ethicon US, LLC and Medtronic, PLC. Drs. Laura Crespo, Andrea Marques, Belén Marín, Rubén Bravo, Estefanía Ramo, Carmen Escalada, and Carmen Arribas have no conflicts of interest or financial ties to disclose.